Get a funny full body colored caricature drawing in digital style drawn from photos. Your Colored Cartoon Drawing will be delivered as a ready-to-be-printed, high resolution file, Canvas or Photo Print. 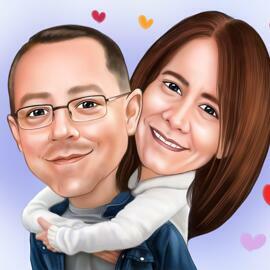 Photolamus will draw an amazing caricature featuring any custom background of your choice. Such an original caricature drawing will make an incredible gift for any woman on Birthday, Valentine's Day or Professional Day. Mention your requirements and ideas of drawing and our artist will draw them brilliantly.